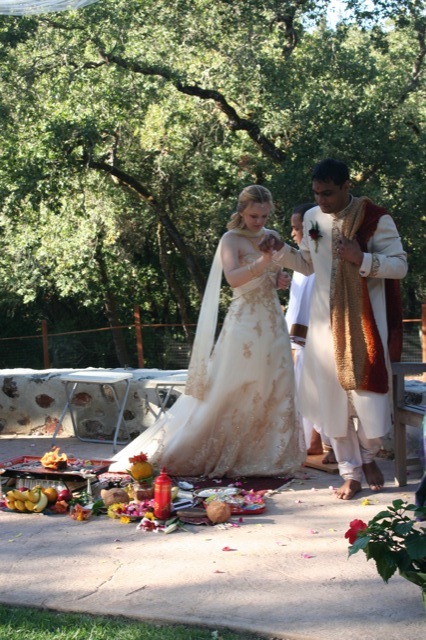 After all was said and done, I’m glad we blended so much of the Indian ceremony into our California celebration. The altar area was beautifully decorated and so many people got to play a part in the wedding. And, it was funny to have the Hindu priest ask us how to pronounce the name “Harrison” (I guess we’re not the only ones baffled by some names). I also got to show off my freshly pedicured feet while stepping on rose petals (seriously, some people pay good money to have their feet rest on rose petals… I think a few did at the nail spa). Plus, I’ve decided I’m going to adopt my husband’s penchant for exaggerating the truth in order to spin a better story. Instead of “I circled the sacred fire 3 times,” I think I will say, “I performed a death-defying stunt in the middle of the ceremony. I was a daredevil, circling a flaming coconut, each time getting closer and closer, with a 10 foot train on my wedding dress!” I’ll have to let him finish the tale with some out-of-this-world meaning for making it around the fire, as I’m not nearly as good as he is yet… but I’m working on it.